Got a collection of empties that you haven’t recycled? 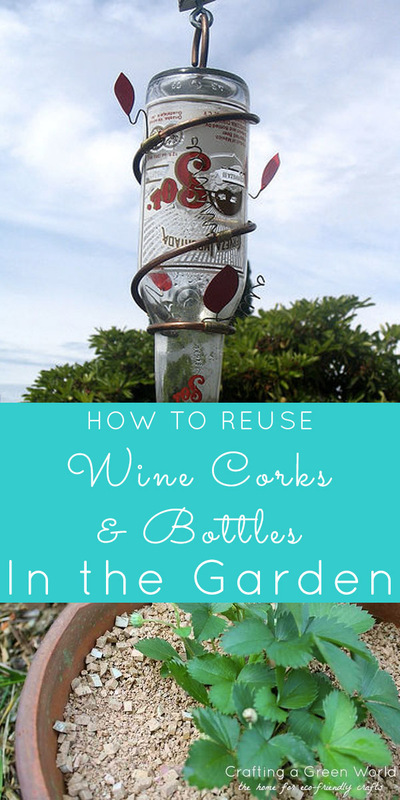 Here’s how to reuse wine bottles and corks in your garden! We love to entertain and hate to toss out anything that might prove useful later on. Of course, what that means is quite a little collection of empty wine bottles and the corks to match. 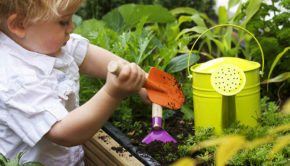 Luckily, it’s time to get our summer garden planted, and our bottle and cork collection might just pay off! 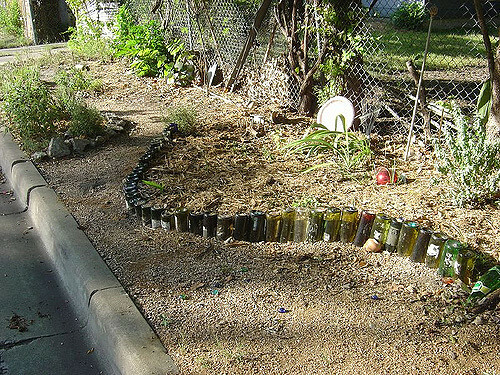 If you’ve got a sizable collection of empties, you might consider using them to line a raised garden bed. If you go this route, you’ll want to be careful if you’re using a weed-whacker out there. That’s a recipe for broken glass in your garden, and you certainly don’t want that! 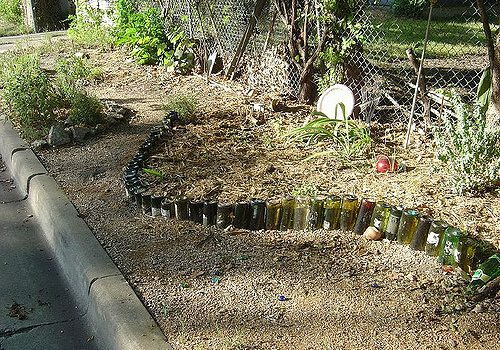 Here’s a good example of a place where the wine bottle garden would work. Since the area around the bed is all covered in gravel, there’s no need to bring a weed whacker anywhere near it. 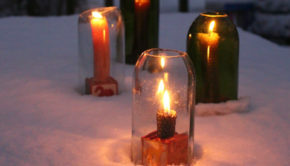 If you’ve got just one or two bottles handy, there’s always the awesome wine bottle gas lamp. My husband made a couple of these for our back yard, and they’re awesome! A word of caution: make sure you buy the right sort of coupling. We had to make an extra trip to the hardware store, because the first one we got tapered way too much, and we couldn’t get the wick through! Another great project that requires just one empty bottle is this handmade hummingbird feeder. Hummingbirds are attracted to the color red, so you might consider decorating your bottle with some red glass paint or even tying a red ribbon around the neck of the bottle. 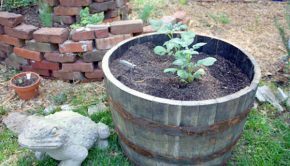 Cork makes awesome mulch for potted plants. 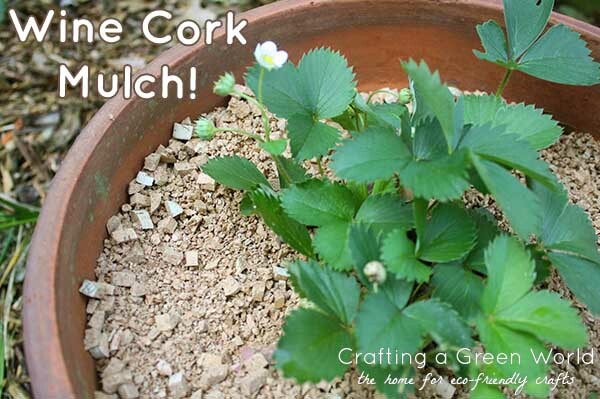 Just cut the cork into teensy pieces with a sharp knife, and you’re ready to mulch! The porous cork will let moisture in and help keep it in the soil. Just remember, we are talking about the old-school corks made from cork oak, not the newfangled plastic ones. With just a little bit of DIY power, you can turn a handful of corks into sweet little garden markers. All you need are some corks, a wire hanger or two, wire cutters, and permanent marker. Cut the hanger into 6″-8″ pieces. Then, use your marker to write your plants’ names on your corks. Gently stick the wire into the cork, and voila! You’re ready to mark those garden rows. You could also use strong glue (or maybe hot glue?) 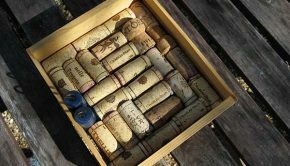 to attach your corks to the ends of thrifted utensils – butter knives would work really well for this! Just let the glue dry completely, and you’re good to go! So, have you guys done any fun wine-themed garden crafts? We’d love to hear your ideas!